We’re super excited to be attending our first SciFiPawty dis weekend on Caturday, March 24. Da party starts at 11am EST and goes til 11pm EST. Appause go to @BorisKitty and @Georgetheduck for all dere work organizing da pawty. And @whskr all da way over in New Zealand haz been busy makin pawsome costumes for so many. So many anipals helpin out wif dis pawty, we don’ts know all dere names. But we fank yoo all in advance for ur contributions to da festivities. 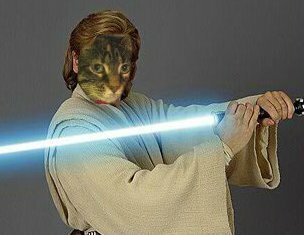 We’ve been tryin on costumes ourselves and decided to go wif a Star Wars theme. We luv watchin all da Star Wars movies wif mum. Dat why we gonna be Luke Skywalker and Yoda. Many fank yoos to @pepperpom who suggested we use GIMP or Faceinhole for our avi. Remember to use hashtag #SciFiPawty. More details available at @BorisKitty website, http://www.boriskitty.com/scifipawty/. Pawty-on to all our anipals. See yoo dis weekend. And may da pawz force be wif yoo. This entry was posted on Friday, March 23rd, 2012 at 10:01 pm and is filed under Feline Lifestyle. You can follow any responses to this entry through the RSS 2.0 feed. You can leave a response, or trackback from your own site.